This edition of the PADI IE has been succesfully completed by all my candidates. 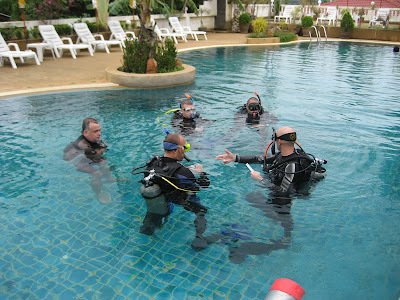 Well done and congratulations to all of you for passing the PADI IE. During the IDC we had some pretty bad weather (see my Samui weather blog) but this IE was completed today under a blue sky, which made for a very well spirited day! 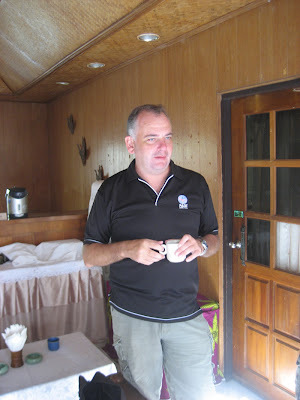 The official PADI examiner on this occasion was Rob Scammell, who had to deal with 7 candidates. The IE started 26th October with an Orientation and the 5 Theory exams and a General Standards Exam. All my five candidates passed with good scores. The morning of the 27th started out in the classroom, where again, all my five candidates passed with high scores. On the 27th in the afternoon, confined water started, here's Rob with some candidates during confined water. Elliott after his Confined Water presentation, his grin tells it all, 3 down, one to go! 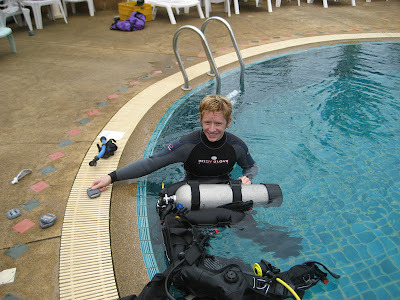 Today saw the last part of this PADI IE, with the Open Water part. Here are all candidates for a briefing by Rob. 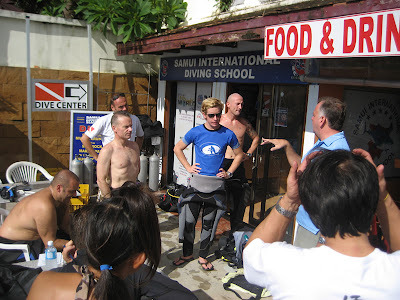 After Rob completed his general briefing, it was down to each individual candidate to do his/her briefing of the two Open Water skills, assigned to them. Here's Kana-san during her briefing for rigging and lifting a lift bag. 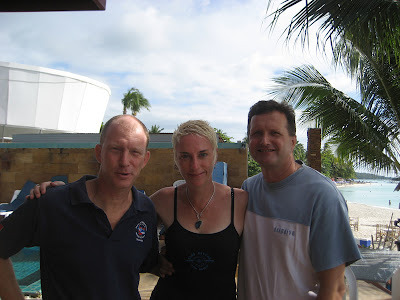 Here's a picture of a bunch of PADI Course Directors, from left to right, myself, Marita Fassbinder, who had two candidates during this IE and Heinrich Gerhard who lives on Samui but teaches IDC's on Phuket who came by to say hello. After Rob completed their Open Water de-briefings, the happy part started. The pressure's off, looks of relief all around by Ivo, Stuart, Jeff (who succeeded today on his 3rd Open Water IE), Elliott and Kana. Here's the official group photo, from left to right Rob Scammell (PADI Examiner), Jeff George (OWSI), Ivo Juric (OWSI), Elliott Jessup (OWSI), Kana Sawada (OWSI), Stuart Hurley (OWSI), Akira Sakugawa (IDCS), Camille Lemmens (PADI Course Director), Andy Poulter (OWSI) and Nobuhiko Abe (IDCS). Missing in the picture is Nazem Youssef (IDCS), he's already back in Dubai, where he lives. For all it's a well deserved day off tomorrow, after tonight's party and than on Tuesday the EFRI course and after that for Ivo and Elliott the Dan O2 and Instructor course and the MSDT specialties. Once more, congratulations to all.